Known all over the world, the Mossad is highly entrenched into Israeli society and only recruits the best of the best. Many apply but few are chosen. Made famous by movies like "Munich" and even "Don't Mess With the Zohan", the Mossad Institute for Intelligence and Special Operations is one of the most respected and feared intelligence agencies performing covert operations all over the world. 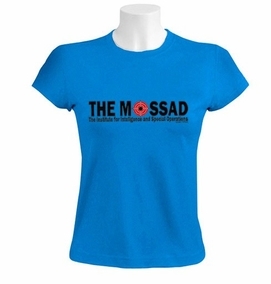 Our screen printed Mossad t-shirt with its bright red target graphic gets the point across quite nicely that it only takes 1 shot for these men and women to terminate their target.Made from 100% Undercover & Combed-Cotton (High-Quality Cotton) T-Shirt, unique and hard to find. Our t-shirts are made of 100% cotton and are long lasting with bright colors. Our products are all designed and printed in Israel.